How much money do you spend on your power bill? No matter what the answer is, it probably seems like a lot. You have to wonder, isn’t there anything more that can be done to bring that cost down? Sure, just keep in mind the HVAC efficiency rating. But aren’t efficient HVAC options expensive, you might wonder? Surely any savings you’d see would be offset by the cost of upgrading. Seems like a real catch 22. Except it doesn’t have to be! Many homeowners want to make their homes more energy efficient, but the cost of doing so can seem daunting. Luckily, there are programs that exist to help absorb the cost of energy efficient HVAC. That means that if you’re willing to do some legwork, you can find a way to make your home HVAC more energy efficient without breaking the bank. Here are just a few of the incentives available to you if you decide to upgrade to energy efficient HVAC this year. Heat pumps work by transferring thermal energy from a source of heat to a specific destination, opposite of the direction of spontaneous heat transfer. That means that instead of heat moving from a hot place into a cold place, a heat pump can take available warmth from a cold space and move it into a warmer one. Refrigerators and air conditioning units actually work with heat pumps, moving thermal energy out of the unit and into an external heat sink. A heat pump is the same, only with a cycle in place to reverse the transfer. It is much more energy efficient than an electrical heat generator, potentially saving you up to 50% on your bill. 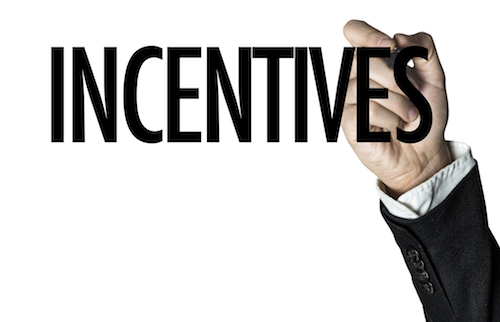 If you want to have a heat pump installed, there are a few different incentives you might qualify for. Check with your public utility provider about any rebates or loans that might be available to you for installing a heat pump. Oftentimes, utility companies offer incentives anywhere from a few hundred to a thousand dollars to get a heat pump installed. Usually it is required to work with a contractor approved by the company, so be sure to take that into consideration when selecting one. Thermostats are not exactly a lively topic of discussion. Most people only think about them when they’re actively trying to heat or cool their homes, which is totally understandable. While very important to the functioning of your HVAC system, they aren’t particularly exciting. Something you may not know is that the right thermostat can run your house more efficiently, especially if paired with a high HVAC efficiency rating appliances. Even if you’ve invested in the most energy efficient HVAC system you can find, you’re still missing out if you’re using it more than you have to. There aren’t just incentives to buy energy efficient appliances, there are also ones to help pay for a smart thermostat to keep them running optimally. A smart thermostat is an internet-enabled device that you can program, allowing you to exert more control over the climate in your house. By connecting the thermostat to the internet, you are able to control the HVAC system from a phone, tablet, or computer. Being able to adjust the temperature of your house without having to get off the couch or out of bed is a nice perk, but that’s only the beginning! With a smart thermostat, you can adjust your home HVAC system from anywhere you can connect to WiFi. Having that kind of control allows you to adapt to whatever the day might hold. As you use a smart thermostat, it is also learning. It can mark when you leave for work, when the house is empty, when people are likely to come home, making adjustments over the course of the day accordingly. With a smart thermostat, your home will automatically start raising or lowering the temperature in your house, keeping the climate comfortable while running as efficiently as possible. So what kinds of incentives are there to installing a smart thermostat? Check with your utility provider for any rebates or cash back programs that may be available. Some companies offer up to fifty dollars if you install a smart thermostat they approve. Often this is dependent on also having energy efficient HVAC appliances in your home, so bundling the two together is a smart plan of action. Investing in a high HVAC efficiency rating system is a great way to keep your energy usage low, but there are plenty of other little things you can do to make your home efficient. Some of them even have incentives of their own! If you’re trying to implement a more energy efficient HVAC system, it’s never a bad idea to think about your insulation. Even if your appliances are running at optimal performance, you’re still going to be losing efficiency if your house can’t keep the heat in or out. If you want to put in new insulation, you might qualify for programs to help cover the cost of installation. Windows can be a major cause of heat leakage, contributing higher cost and lost efficiency. It’s worth looking into incentive programs that pay you for the square footage of new, more energy efficient windows. This can help absorb the cost of more expensive, but better insulated, windows. Homes are hardly airtight vessels, full of little cracks and gaps that air can escape through. There will always be some heat or cooling lost in a house, but that doesn’t mean you shouldn’t do everything you can to minimize it. If you’ve got appliances with good HVAC efficiency rating, good insulation, and good windows, it’s time to make sure everything is sealed tight. You can qualify for cash incentives to seal air leaks in your home, helping your appliances run at peak efficiency. Are you ready to make some energy efficiency upgrades? If the answer is yes, reach out to us at Entek. We are well informed on the current factory and utility rebates available to homeowners and can walk you through on any rebates and incentives you are eligible to receive. We will also take care of applying for the necessary permits, as well as submitting all the rebate information on your behalf to make the process as seamless as possible. Contact us for a free estimate and learn all the ways you can save money in 2018. Remember, having an energy efficient HVAC system heat and cool your home is only half the battle. The other half is keeping that indoor climate indoors!